Energizer's crazy pink drumming bunny hopped into our psyches in the '80s and he's still going strong, but it's nice to know that the brand's technology isn't stuck in the past. Energizer has a whole range of batteries that are specifically engineered for optimal performance in high tech devices. We've used their Lithium batteries for years but now that both kids are old enough to have battery-powered toys, it seemed wise to switch to rechargeables. Energizer offers a whole slew of Rechargeable Batteries and Chargers. We have a zillion AA and AAA rechargeables floating around our home, since those are what we use most, but what about that new toy grandma brought over that requires D batteries? Oh, yikes. When I was little, it seemed like most battery-operated toys took Cs or Ds. And a lot of them. These days, not so much. Still, it happens. Jasper loves robots and it seems like they're all foreign and require gigantic batteries, which I don't tend to keep in the house. 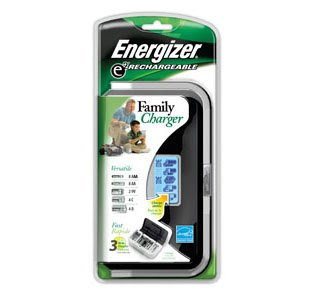 Luckily, there's a fantastic solution: the Energizer® Family Charger. 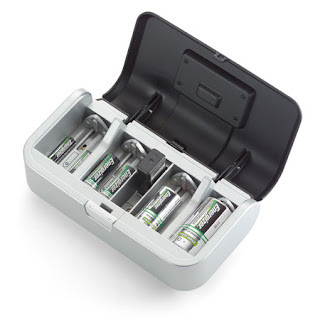 The Energizer® Family Charger charges up to 8 AA, 8 AAA, 4C, 4D or 2 9V NiMH rechargeable batteries. I didn't even realize they made rechargeable Cs, Ds or 9 volts! I was so excited. The Energizer® Family Charger is Energy Star-certified, will only charge when the door is securely closed (safe for kids!) and can recharge batteries quickly- in about 2 hours for 4 AA batteries and 7 hours for 2 9V batteries! Better still, it features an LCD screen that shows the charging status of the batteries so you know what to expect. I think this is a great item to keep in the house, but how handy would it be to throw in your suitcase on family vacations? It seems like you could recharge your batteries overnight and never have to make pit stops to buy batteries for your cameras and DVD players. Thanks to Linsey (an official online advocate for Energizer) for hooking me up with the Energizer® Family Charger. I am sure we will get a lot of use out of it in the future. That is awesome! Thanks for the info - seems like a worthwhile investment. I always run out of 9V batteries (the baby monitor takes those) at the worst possible times! I got one too! Energizer is awesome! Battery chargers have come a long way! I love mine, although it's another brand. It seems like the birth of a child brings an influx of battery operated products. Prior to SoJo, I think it had been 5 years since I bought batteries.